For more than half a century, the name Marantz has identified the best in home entertainment. Marantz produces some of the most solid AV equipment on the market. From stereo recievers to integrated amplifiers, from universal disc players to various size amplifiers, from pre-amps to processors, from streaming media players to all-in-one units—Marantz makes it all. 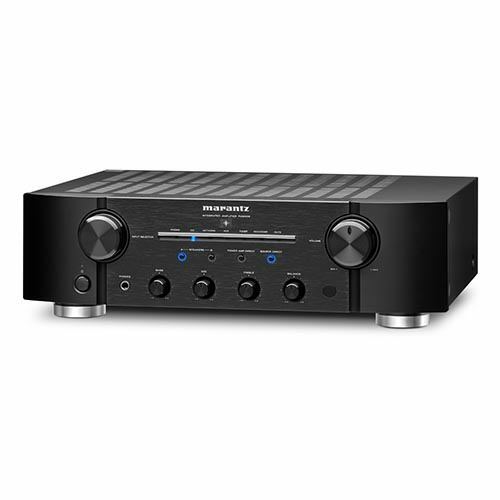 Not only are Marantz products trustworthy, good looking, and powerful, they are also set at various price points, which means that they have pieces that can fit your budget. If you have any questions about any of the products you see, let us know via our contact page or give us a call at 877.733.3547—we’d love to help. More than any other person, Saul Marantz defined premium home entertainment. Driven by his passion for music and his accomplishments as a classical guitarist – accomplishments that led to a close friendship with Andres Segovia – he was never satisfied with the “hi fi” equipment of his day. So he built better; first in his basement, later in a factory. His talent for industrial design and his ability to infuse talented engineers like Sidney Smith and others with his vision resulted in legendary products, and insured that his company would remain a premiere name in the industry he helped establish. And today, even in the midst of burgeoning and often confusing technology, these components still emulate the vision that originally drove Saul Marantz to expand the sensory horizons of even the most demanding aficionados. In 1983, consumer digital audio became a reality in North America. And Marantz’s CD-63, the first publicly announced CD player, led the way. This groundbreaking development was soon followed by the appearance of the CD-12, the world’s first two-piece CD player. Announcement of the CD-63, led the way. was there at the very beginning. Marantz also becomes involved with video for the first time with the CDV-780 Laserdisc player. What’s next? Most certaintly the promise of quality and excellence as only Marantz can deliver.